Summary:Within a few weeks after their breakup, Audrey’s boyfriend, Evan, writes and performs a rock song about their split that catches the attention of a music executive and catapults Evan and his band to stardom. Because she is the song’s subject, Audrey suddenly becomes a celebrity, too, and over the course of a school year, she finds herself dodging paparazzi, rock stars in search of a muse, and star-crazed classmates. 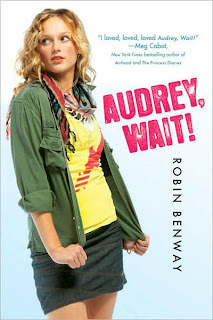 Set in Southern California, Benway’s memorable debut is a highly entertaining fantasy of teen fame, narrated in Audrey’s sardonic voice and perfect timed comedic lines that channel contemporary YA culture: “It makes my parents crazy how I can do all of this at once, talk on the phone and email and IM. I’m just like, how can you not?" My Thoughts: Audrey, Wait! is an amazing book! Its one of the best books I've read this year! I just loved it from start to finish! I usually don't rate books this high because either 1. They just aren't that great. 2. Because they don't seem to compare to my obsession of how good The Twilight Saga or Harry Potter was. I do enjoy books but I don't love love love them! This one was one I actually loved. I loved Audrey, and I loved James. I even loved to hate Evan! I don't know why I waited so long to read this. It stayed on my wishlist for a while, than once I got it it went on the bookshelf until a few weeks ago, I needed a new book for a paperbackswap game and it had to be young adult so I choose to put this one in! This book had it all. Humor, belonging, and a sense of excitement. Have you ever dated a boy in a band? I have and I've been there before! I totally understood Audrey!!! Go out and rend this book, like now! Are you at the bookstore yet? Overall: GREAT GREAT GREAT GREAT GREAT, thats really all there is too it! Cover: I really this this cover is cute! It totally fits. I had the softcover so this was the cover. I looked and the hardcover image is different. I definately prefer this one over the hardcover. I LOVED this book, too! The hardback cover is one of my all time favorites. I'm pretty thrifty, but just had to own this book in hardcover. I don't know why, but I'm always choosing the cover that everyone else seems to like less, but whatever. We seem to agree on the heart of this book and you're right, it was fantastic! Omg, this is one of my fave books too! And the cover is AWESOME. I really enjoyed this altogether :) I liked your review!